I haven't been following popular music for very long, but one thing I've noticed is that critics generally seem to recoil with loathing at any work that smacks of "high art." Any popular musician who throws out a basic music theory term is suddenly derided as pretentious and full of themselves, and god forbid anyone who dabbles in "classical". This is even stranger, because popular music critics are just as pretentious and snobby as their classical music counterparts, only in a completely different way. As a friend pointed out to me, the same critics, fans and store owners who would skewer you alive for mistaking techno for house, or hip hop for trip hop, have no problem throwing two thousand years worth of Western art music into the same "classical" bin. Of course, as a former classical music snob, I must say that we're not exempt from turning up our nose at the other side either. But I feel that there's a lot of potential to create some sort of music that lies between the punk rock band and the symphony orchestra, but the standoffishness on both sides has meant a lot of wasted potential. I bring this up because the Moody Blues do a lot of interesting stuff mixing old-fashioned rock and roll with some rather bombastic symphonic stuff. The results aren't always stellar, (it doesn't help that there are critics out there that are quite literally comparing the Moody Blues to Scriabin), and the rampant drug-addled psychedelia ruins some otherwise interesting ideas. But the band does manage to transition back and forth between the rock outfit and the symphony orchestra surprisingly well, creating some rather cohesive music out of two supposedly disparate sources. The first important Moody Blues album came out in 1967, back when the rock landscape was still rife with genre-bending possibilities. 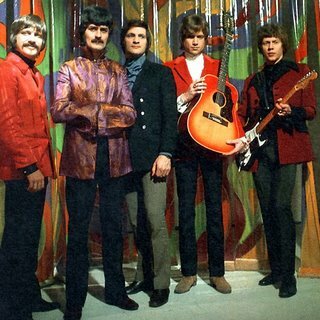 A lot of the music sounds dated today, but the Moody Blues also create a lot of orchestral-rock crossover material that sounds unique in its own psychedelic way. It's a dead-end which I'm not sure if a lot of subsequent acts followed up on. But I'm glad the Moody Blues created this little historical cul-de-sac, if only so I can pull in and get a change of scenery for a while. WHAT I KNEW BEFORE: I'd heard "Tuesday Afternoon" and "Nights in White Satin," both classic rock radio staples. MY LISTENING: I listened to Days of Future Passed (1967) every day this week. I also listened to In Search of the Lost Chord (1968) four times, On The Threshold of a Dream (1969) twice, and Seventh Sojourn (1972) once. WHAT I LIKED: The quintessential Moody Blues record is Days of Future Passed. It's sort of a ridiculous concept album built around an archetypal "day in the life," beginning with "dawn" song and ending with a ballad for "night." But it's an interesting crossover - the orchestra in the overture "The Day Begins" lays out the musical themes that will return in the guise of a rock ensemble. I suppose this sort of posturing could be dismissed as pretentious, but I'm willing to accept this exchange of ideas between classical forms and classic rock. And, despite the grandiose intentions, the band does a good job transitioning from song to song, from orchestral theme to guitar riff. Listen to something like "The Sunset/Twilight Time", which deftly transitions between the orchestra and two rock songs. The band smoothly swerves from one theme to the next, but the track (and the entire album, for that matter) hardly seems muddled or incoherent. I have to give the band credit for weaving all of these smaller musical ideas together, while still finding room for enjoyable (albeit corny) ballads like "Nights in White Satin" to come in at the end. Though On the Threshold of a Dream doesn't have the full-force of the London Symphony Orchestra behind the band the way Days of Future Passed does, the Moody Blues still do a lot of interesting stuff. A lot of it doesn't really click here in 2010, but I have to admit that I take enjoyment in the sheer weirdness of "The Voyage," a weird mish-mash of psychedelic rock and late romantic classical music. WHAT I DIDN'T LIKE: While the Moody Blues have some interesting ideas and audacious ways of carrying them out, too much of their music is weighed down by dated 1960s psychedelia. If the songs I cited above are the few that I think stand the test of time, there's a dozen more that contain insufferable lyrics, mystical spoken monologues, mind-boggingly repetitive references to LSD, and embarrassingly presumptuous lessons in metaphysics and life. The easiest song to point to is "Legend of a Mind," a six-minute paean to Timothy Leary. But the culprits are endless. "Om," a pointless sitar-based ode to faux-Eastern mysticism. "Are You Sitting Comfortably? ", a bland attempt to emulate medieval troubadours. And so on. Come on - is it possible to find a good classical/rock crossover without the pretentious metaphysical drudgery that usually comes with? FURTHER EXPLORATION WOULD ENTAIL: The Moody Blues do have other albums that were popular in their own time, but I think I'm fine sticking with the albums I listened to this week. In a similar vein to the Moody Blues, however, I think I may add King Crimson to my list of bands to tackle one day. BEST SONG YOU'VE HEARD: "Tuesday Afternoon"
Again, listen to the flawless transition between three different songs on this one track. And ignore the moralistic lines like "Working, living, it brings / Only way to have those things". BEST SONG YOU HAVEN'T HEARD: I can't really pretend there are hidden masterpieces buried need in Moody Blues albums, but there's a few interesting pieces worth listening to. Instead, here's "Go Now," the 1964 song that catapulted the band to prominence...and sounds like nothing else they've ever done.